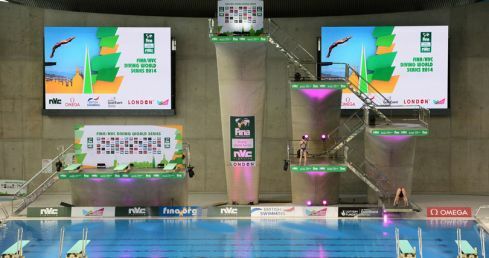 The British leg of the 2015 FINA/NVC Diving World Series will take place at London Aquatics Centre in the Queen Elizabeth Olympic Park. The 2014 World Series was the first international event hosted in the venue since the London 2012 Olympic Games. The pool was originally designed by Zaha Hadid and cost £251 million to construct in time for London 2012. It hosted 17,500 spectators for the swimming, diving and synchronised swimming events at the Olympics as well as the swimming events at the Paralympic Games. The Aquatics Centre's spectacular wave-like roof is 160m long and is one of the iconic features of the Queen Elizabeth Olympic Park. Following the Games, the venue was reduced to 2,500 permanent seats, expandable to 3,500. From spring 2014, the Centre opened to the public as well as being a High Performance Centre for British Diving. The FINA/NVC Diving World Series 2014 wass part of the pool's ever-expanding legacy and it will soon host the European Championships in 2016. The nearest stations are Stratford, Stratford International, Hackney Wick and Pudding Mill Lane. Tickets start from just £10 for adults and £7 for U16s. Buy yours now from Ticketmaster. Watch video interviews with some of the top British and international performers from London. Compare your favourite divers' head-to-head record with another of the world diving elite.